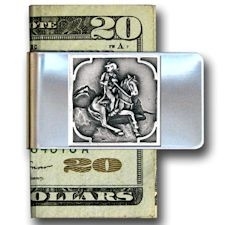 This cowboy on his horse money clip has a shiny silver stainless steel clip with an overlaid pewter medallion, which is made from fine 100% lead free pewter. This metal combination is very durable and wears very well for daily use, especially in situations where rubbing will occur, such as in a pocket. Softer metals, such as sterling silver, won't hold up as well. This money clip can be shipped internationally. This product was added to our catalog on 08/29/2018.